The spate of structural strengthening of our socio-economic foundations continued through the FY18. The momentum gained through demonetisation, real estate regulation, and insolvency and bankruptcy laws of FY17 was accelerated through smooth implementation of GST and recapitalisation of banks in FY18. The momentary slowdown in economic growth appeared to settle down with FY18 GDP growth at 6.7%. 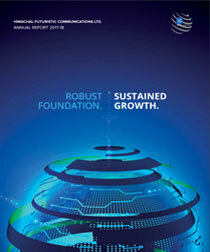 The road ahead from hereon shall witness steady pick up in our growth rate. FY18 was a watershed year for the Indian Telecom Industry. Prolonged competition led to a year of tectonic consolidation where two large players merged and a new incumbent gained rapid market share. The turf continued to shift from call and VAS revenues to data-linked play. The Government of India continued to further its agenda of digital readiness for defence forces, rural population and un-served geographies across northeastern and LWE regions. The rapid spread of smartphones and mobile internet at one hand and rising popularity of social networking and digital content on the other hand is setting the stage for next wave of telecommunication revolution. It is in this context that your Company’s steady strengthening of its business foundation yields a decisive enabler, going forward. 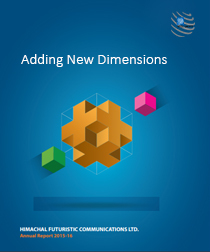 The shift from wireless to Optical Fibre is imminent, gradual and mammoth. 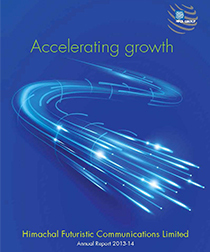 The spread of fibre would follow with its densification and fibre reaching the doorstep of consumers. 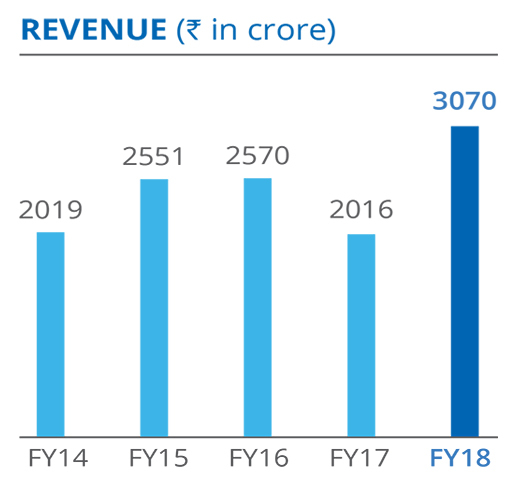 We are looking at a period of sustained and accelerated growth in demand for fibre as well as telecom network overhaul and expansion. TRAI’s recommendation of ‘net zero import’ of network equipment makes your Company a strong contender to seize this ‘Make in India’ opportunity. Intensification of our Research & Development efforts towards innovative, yet fully indigenous WiFi network solutions has fructified. You will be happy to note that the solution shall be ready for deployment by the end of 2018. This would enable us to participate in the government’s initiative of deploying 1.25 million WiFi access points across 2,50,000 Gram Panchayats. Infusion of modern technology in railway telecom and signaling offers dual advantages of passenger safety and track optimization. With over 60,000 route kilometers of legacy systems on the block for revamp, your Company’s experience and learnings from the three ongoing projects in dedicated freight corridors would add to our qualification. Building upon its initial success in Ludhiana and Jaipur, our smart city division has tasted a bigger success in Rajasthan in the year gone by. Our foray in defence equipment manufacturing is steadily shaping up, with one of our bids reaching the equipment trial stage and many others awaiting evaluation and results. 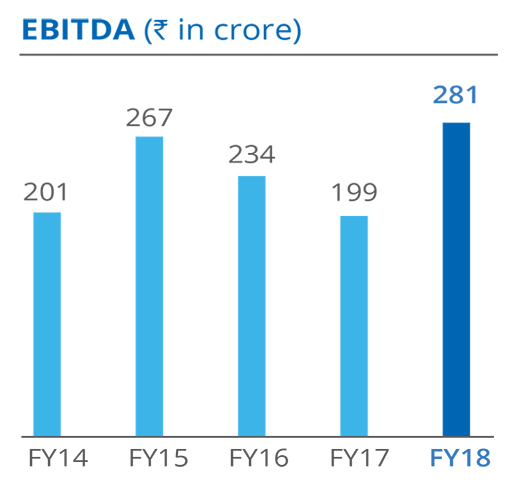 From total revenue of ₹261 crore in FY12 to gross EBITDA of ₹281 crore in FY18, your Company has scripted a remarkable turnaround. 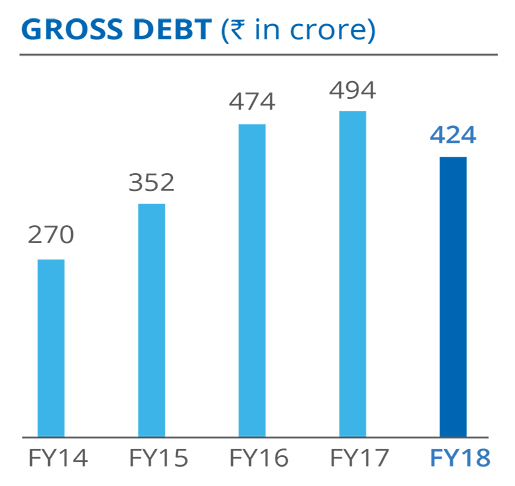 The strength of our balance sheet with steadily strengthening cash flows and credit ratings are powering our growth oriented CAPEX and OPEX needs. In order to insulate us from supply constraint of optical fibre, we are foraying into its manufacturing with 6.4 million fibre kilometer (mfkm) pa capacity as a first step of backward integration. The move is also going to enhance our profit margins. We are also raising our OFC manufacturing capacity from 8 mfkm pa to 15 mfkm pa by adding a Greenfield plant of 7 mfkm pa capacity at Hyderabad. Construction work for both these plants is in full swing with orders for key machinery and equipment already placed. With a combined CAPEX of ₹300 crore, both these facilities shall commence commercial production in FY20. Our turnkey network division continues to implement and win new marquee projects across the country. The current outstanding order book of the division is exceeding ₹8,250 crore. With rising capabilities and stature, the division is also contemplating to venture into overseas markets in the near future. 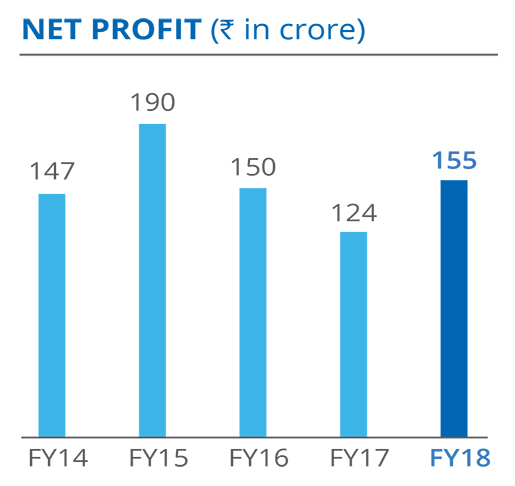 You would be happy to note that our revenues grew by 52% to ₹3,070 crore, EBIDTA grew by more than 40% to ₹281 crore and Net Profit stood at ₹155 crore during FY18. We succeeded to reduce our total debt by ₹70 crore. 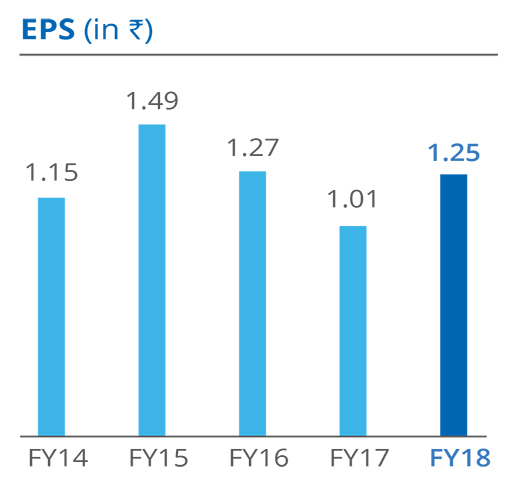 The EPS, at ₹1.25 per share, grew by 24% over the previous year. The most vital asset of our Company is its people capital. The human ingenuity and pursuit of excellence has led to quite a few product innovations during the year. We are investing significant attention and resources in raising the skill, motivation and productivity quotient of our talent pool. The compassion, urgency and scale towards extending a helping hand to the needy and opportunity deprived sections of our society reached its best during FY18. Environmental sustainability and community sustenance is prerequisite to business sustainability and your Company would continue to increase its efforts to address its responsibility towards them. 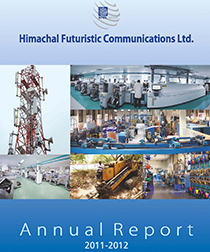 I place my sincere appreciation to the members of the Board and our leadership teams for their incisive contributions in making HFCL a rising force in the telecom and adjacent spaces. I extend special acknowledgement to the stellar efforts and contributions of HFCLites and thanks to our valued customers and partners. To the shareholders and the financial community, your trust and confidence in HFCL, gives me immense confidence in successfully steering this promising Company of yours to greater heights, always. Let us all work towards a fabulous HFCL. Mr. Shukla the Chairman of HFCL is a qualified Electrical Engineer having immense experience in the telecommunication industry and has worked at very senior positions in various undertakings owned by the Government of India. He was the Chairman and Managing Director (CMD) of Telecommunications Consultants of India Ltd. (TCIL) and thereafter functioned as the CMD of MTNL. Working with MTNL, he spearheaded the delivery of meaningful, efficient and reliable telecom services. 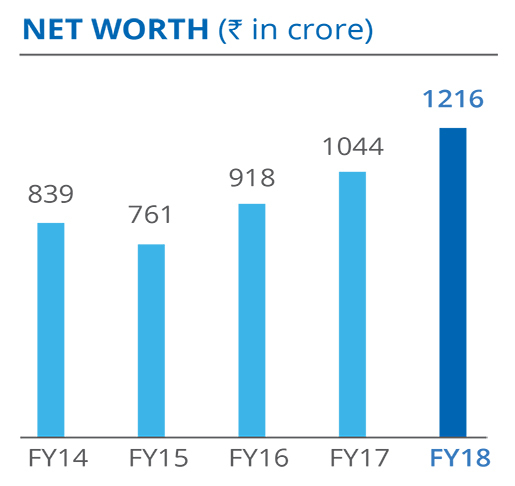 Under his leadership, TCIL recorded healthy growth and was adjudged as the highest Net worth growing company among the Government undertakings. TCIL also won best Government Consulting Company award under his leadership. He has been bestowed with various awards for his outstanding contribution to the Telecom Industry including Telecom man of the year – 1992. Mr. Nahata is the Promoter and Managing Director of HFCL. He completed his graduation in B.Com (Hons.) from St. Xavier’s College, Kolkata. He leads the overall strategy and planning, business development and marketing activities of HFCL. Mahendra Nahata is also on the Board of Reliance Jio Infocomm Limited, a subsidiary of Reliance Industries Limited. He is one of the pioneers in the New Age Telecom sector of India and has been associated with many esteemed forums related to the telecom industry. In the past, Mahendra Nahata had been member of Board of Governors of Indian Institute of Technology, Bombay and Indian Institute of Technology Madras. He had also been the Member of Board of Governors of Indian Institute of Information Technology, Allahabad and Member of Council of Scientific & Industrial Research, Government of India. Mahendra Nahata had been President of Telecom Equipment Manufacturers Association of India (TEMA), Co- Chairman of the Telecom Committee of Federation of Indian Chamber of Commerce and Industry, Chairman –Telecom Committee of PHD Chamber of Commerce & Industry. 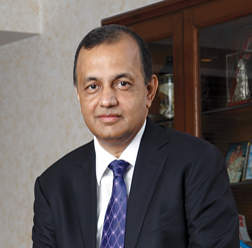 Mahendra Nahata was given "Telecom Man of the Millennium" award by Voice & Data in 2003. Mr. Kharabanda is a member of the Institute of Chartered Accountants of India. He carries with him vast experience in industries as varied as telecommunications, broadcastings, IT, electronics, consumer durables and white goods. Arvind Kharabanda has expertise in the field of management discipline such as marketing, manufacturing, project appraisal, finance, and corporate strategy and planning. Dr. Kastia conferred with the Doctorate Degree in Chemistry has vast business experience. Dr. R. M. Kastia is also a Fellow of British Institute of Management (London). 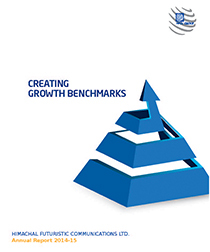 It is under his advisory role , HFCL has grown to its present position as one of the leading telecom companies. Dr. Kastia has worked at senior executive positions with various organisations like Rajasthan Spinning. 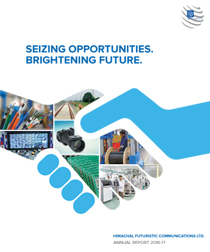 & Weaving Mills Ltd., Hindustan Electro-Graphites Ltd. and Shriram Chemical Industries. He was Executive Director of Modern Insulators Ltd. and Willard India Ltd.
Mr. Soni, holds masters degree in Mathematics from Saugar University, Madhya Pradesh and also holds JAIIB certification from Indian Institute of Banking and Finance. He is 1999 batch probationary officer and having 18 years of banking experience across 3 banks at various positions, fields and geographies. He joined IDBI Bank in the year 2007 and presently working as General Manager in Mid Corporate Banking group at New Delhi. 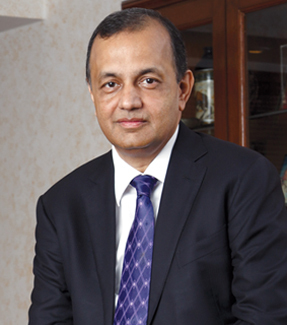 Prior to joining IDBI Bank, he has served Dena Bank for more than 7 years. During his banking career, he gained experience in Corporate Banking, MSME Sector lending and Priority Sector lending, especially in structured products viz. Micro Finance Sector, Securitization deals and Interbank Participation Certificates & Priority sector lending certificates. Mr. Surendra Singh Sirohi graduated from IIT, Kanpur with a bachelor’s degree in Electrical Engineering. Mr. Sirohi had been Member (Technology), Telecom Commission and ex-officio Secretary to Government of India in Ministry of Communication & IT. As Member (Technology) in Telecom Commission, he was instrumental in formulating several regulatory and strategic initiatives and key policies for an inclusive growth of all segments of the Telecom Sector. During his career spanning thirty six years in Indian Telecom Service, Mr. Sirohi held numerous techno- managerial senior leadership positions in various organizations in Telecom Sector viz. Department of Telecom, Government of India, Mahanagar Telephone Nigam Limited, Telecom Consultants India Ltd (TCIL), Bharat Sanchar Nigam Limited (BSNL) and made a positive difference by providing dynamic and visionary leadership with pragmatic and strategic approach in his each assignment. Mr. Sirohi has a rich experience of over 36 years in the field of telecommunication particularly in the area of National Policy, Sectoral-regulations, Planning & Development, Corporate & Business Strategy, Network Planning & Operations, Research & Development, Project Management, Management of Telecom Services Operations etc. Mr. Sirohi has widely travelled with varied international exposure and has represented India on global fora on several occasions. Mr. Ved Kumar Jain is a Triple Bachelor’s Degree Holder. He completed his Bachelor of Science from Punjab University in 1973. He did his Bachelors of Arts in Economics in 1979 and completed his Bachelors of Law in 1980. He is a Fellow Member of the Institute of Chartered Accountants of India (ICAI) for more than four decades. 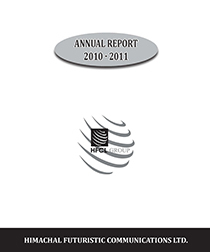 He had been the President of ICAI during 2008-2009. He has been on the Board of International Federation of Accountants (IFAC) during 2008-2011, a global organization for the accountancy profession comprising of 167 members and associates in 127 countries. He has been Founder Board Member of Indian Institute of Corporate Affairs, set up by Ministry of Corporate Affairs, Government of India. He has more than four decades of experience on advising corporates on finance and taxation matters. Mr. Jain specializes in Direct Taxes and has handled complicated tax matters, appeals and tax planning of big corporates. He is regularly involved in the consultation process of the Ministry of Finance and Ministry of Corporate Affairs and member of various expert committees/panel constituted by the Government of India for fiscal and commercial legislations. Dr. Tamali Sen Gupta completed Bachelor of Arts in Economics (Honours) from University of Delhi and LL.B from Law faculty, University of Delhi. She did her Doctorate and Masters in Law from the Stanford Law School, Stanford University, California. Dr. Sen Gupta has 32 years’ experience in the legal field and is a specialist in transnational legal transactions in media, real estate development, insurance and infrastructure. She is the Principal of T. SEN GUPTA & ASSOCIATES, a corporate law firm based in New Delhi, which provides advice on corporate law, entertainment law, intellectual property, insurance, project finance, corporate governance, and privatization. Dr. Sen Gupta also has extensive experience in international joint-ventures, collaboration and licensing agreements, mergers and acquisitions. She has represented Indian companies in joint-ventures overseas and in relation to joint ventures in India with multinational corporations. Dr. Sen Gupta has extensive experience in the structure of projects implemented under Project Finance and on foreign participation in the privatization of infrastructure. Sectors worked on include roadways, railways, ports, power and township development, both in India and overseas. She has wide experience in negotiations and drafting documents for privatization projects and has dealt with various forms of contractual agreements for project finance, including inter-alia, Concession agreements (BOT, BOOT, BOLT) as well as EPC & O&M Contracts. She has advised on telecom Project for installing a fibre optic link throughout railway network of the Indian Railways and commercializing the service to provide basic telecom services to telecom companies. She is a widely published author and written books on various subjects including Telecom. She is a Fellow of the Center of International Legal Studies at Salzburg. 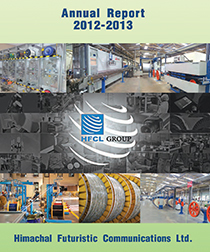 HFCL Advance Systems Pvt. Ltd.
Intimation under Regulation 30 of Securities and Exchange Board of India (Listing Obligations and Disclosure Requirements) Regulations, 2015 – Appointment of Dr. Tamali Sen Gupta (DIN:00358658) as an Additional Director in the category of Independent Women Director on the Board of the Company. HFCL awarded overseas contracts worth INR 148 crores by Larsen & Toubro (L&T) to set up Telecommunication Systems for Mauritius Metro Express & Dhaka Metro Mass Rapid Transit System Projects. HFCL bags Advance Purchase Order for Rs.579 crore approx from Bharat Sanchar Nigam Limited (“BSNL”) for building 2G Global System for Mobile (“GSM”) Base Service Set (“BSS”) Network in Assam. Acquisition of Equity Shares of Polixel Security Systems Private Ltd.